Back by Popular Demand: The Big Bag & Jelly Roll Rug Classes. Two of our most popular classes are back per your request! If you missed them the first go round... you have another chance to hop in on the fun. The Big Bag class and Jelly Roll Rug class, both taught by Shelley Taylor will be offered again the last weekend in April. That's coming right up! Space is limited in both classes due to the amount of space needed to make each project so don't wait to sign up. There's also some prep work you'll want to get started on so you can be prepared to finish your projects in class with Shelley's guidance. Let's talk about The Big Bag. Why is it so popular? First of all, look how darling it is! The Big Bag, designed by Bodobo Bags is generously sized as you may have guessed from the name, perfect for traveling, shopping, classes or retreats. Inside you will find two pockets you can customize. Two long handles make it easy to carry and look great with the large metal grommets. If you've had a piece of designer fabric or linen that has been waiting for the perfect project, this is it! Soft and Stable gives this bag shape and makes it extra durable. Shelley will be teaching this class Friday, April 26th, 1:00 p.m. - 5:00 p.m. at our retreat center. Register here online or in-store for $25. Pattern and supplies must be purchased separately and are available at the shop. View a complete supply list on our website. 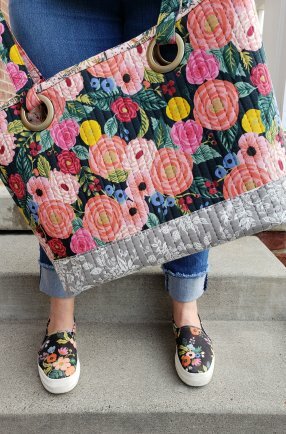 Stop in and see how fabulous this bag is in person and let us help you find everything you need to make your own. You know you have jelly rolls sitting around and you don’t know what to do with them. Make a Rug! The craze is still all over social media. Shelley Taylor is excited to show you how fun they are to make! 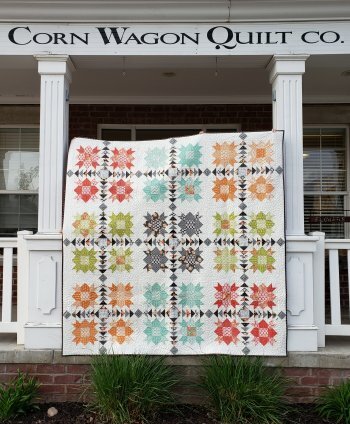 We have oval and rectangle Jelly Roll Rug patterns by Roma Lambson of RJ Designs available at Corn Wagon as well as rolls of pre-cut batting strips. Choose the style you want to make, grab a jelly roll and let's sew Saturday, April 27th, 10:00 a.m. - 4:00 p.m.! Register here online or in-store for $30. Pattern and supplies must be purchased separately and are available here at the shop. View a complete supply list on our website. 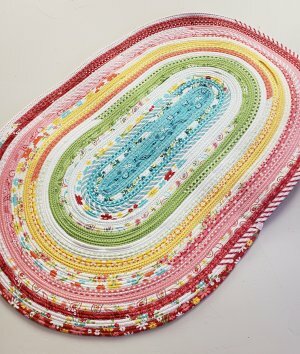 If you haven't seen a Jelly Roll Rug in person, stop in and check out our sample. We even have a coiled ball as described in the pattern instructions so you can see a bit of the process and get an idea of what you'll be doing when you make your own Jelly Roll Rug! Returning to town after spring break I was amazed to see how green all the grass had become! Then I returned to the shop to see that Marianne Michaels had finished this cute wool applique project. Perfect timing! Spring has Sprung! We have patterns by Buttermilk Basin and kits ready for you to whip this one up in time to display for Easter. Happy spring sewing! Here's the finished quilt in all it's glory! Julie Hancock did a beautiful job piecing this Thistle quilt designed by Joanna Figueroa of Fig Tree and, as you know, Ramona added some wonderful custom machine quilting. We have kits! As my fellow Utahns know, just because spring has arrived, doesn't mean the chill has gone... some days more than others and changing by the minute. This suede-like, 68" flannel quilt will warm you right up! 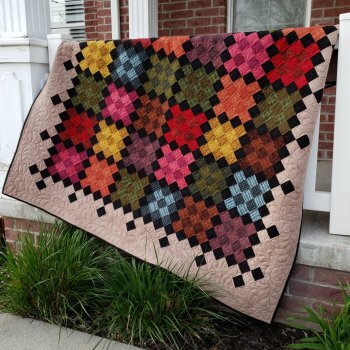 Karen Averett pieced the Hopscotch quilt by All Through the Night using Wool and Needle Flannels from Moda. These are some of the highest quality flannels available and they have the most wonderful hand. The deep jewel tone colors glow like stained glass and are enough to warm me right up! Kits and patterns available in store. Ramona Sorensen worked her custom machine quilting magic on this quilt as well. Don't forget, custom quilting designs are April's machine quilting motif-of-the-month and will be 20% through April 30th! Monday, April 8th - 25% off FLANNEL ! Don't forget to stop in and see what's on the porch at an extra deep discount!